You control Victor with a controller that you cannot see, because you play this game with the Oculus Rift VR headset strapped to your face. You push Victor forward with a tilt of the analog stick and make him leap, icepicks drawn, toward the side of a glacier. As he clings there, you can tilt your head down. You won’t see your living room floor. You’ll see the chasm below. You can look up and see the big sky above. You’re not simply playing a game like Uncharted or Tomb Raider. You’re inside of one. Edge of Nowhere is one of the first virtual reality games made by an elite game studio, in this case Insomniac Games, makers of Ratchet & Clank, Resistance and Sunset Overdrive. For their VR debut, Insomniac trades their usual style of fast-paced, visually-frenzied, fully-automatic mayhem for something plainer and more careful. Our hero moves slowly as he climbs ice walls and creeps through caves. Victor finds monsters in those caves, but fights just a few at a time. He’s often strapped for ammo and forced to distract patrolling enemy creatures before slipping by. He’s looking for his fiance, whose expedition to find new life at the South Pole has gone missing. He might be slowly going mad. All of this is good, if basic. In this case, the game’s conservatism is a benefit. Many early VR games on the Oculus Rift or rival Vive are either so fast-paced or so poorly optimized that they nauseate their players within 25 minutes. Or they are so skeletal that they take half as long to bore them. Edge of Nowhere feels healthier to play. It’s comfortable. It’s the first VR game I’ve physically been able to play for an hour at a time. It’s also the first VR game that I’ve wanted to play in lengthy installments. It helps that the developers used a trailing camera that doesn’t trick my inner ear and make me queasy. Better than that, the game simply functions like so many classic games before it as it introduces simple gameplay ideas and then tweaks those ideas or layers new ones upon them. There’s a story unfolding as there is in so many games, both about what is happening and in what you’re learning to be able to do. You start just being able to control a guy who can climb the sides of glaciers and avoid deadly, spiky plants. Soon enough, you’re learning to be more acrobatic with your climbing as you leap from wall to wall and intentionally fall and catch yourself. You’re discovering new enemies, some that are extra sensitive to sound, others that you can trick into impaling themselves on those spiky plants. You find journals to read and find slightly better gear. The interactive stuff is pure PlayStation or Xbox third-person action game, and would suffer in comparison to its best genre peers were it on those machines and, more importantly, played on a monitor or TV. 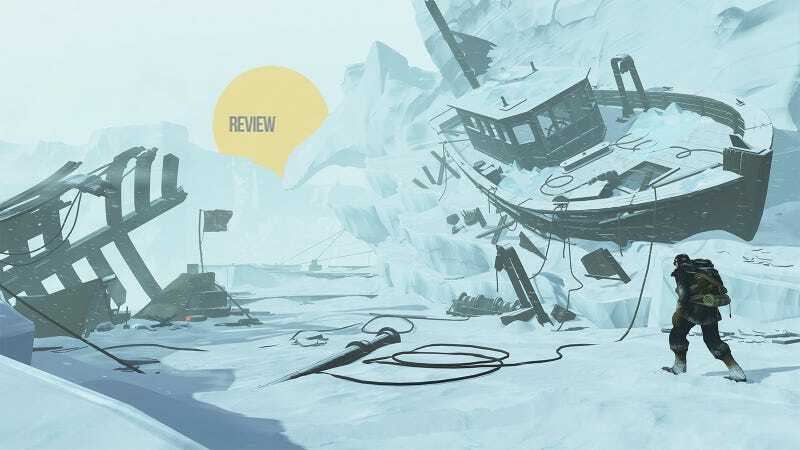 Edge of Nowhere’s commendable novelty, however, is primarily its virtual Antarctic setting, which is used to wow the player with a sense of awesome scale. On a flat monitor or TV screen its environment would simply seem to stretch far out. In immersive VR where the game’s graphics appear to surround the player, Victor is dwarfed by the snow and ice around him. When enemies chase Victor, the bold player who guides him forward but dares swivel their own head back will see packs of monsters emerging from deep caves. As they look back forward they will see Victor approaching an ice bridge that seems vertiginously high. It’s even more spectacular when he encounters a giant house-sized enemy. It strides overhead at one point. The player who decides to look up will see a humbling monstrosity walk over them. The game ends quickly. I stretched it over three play sessions but was done in around four hours. Arguably, that’s enough. Edge of Nowhere’s enemies are not that smart and the game’s visuals and environments are not that varied. Its gameplay doesn’t get all that deep and at times seems to go on auto-pilot, a sign that the developers hadn’t figured out how to give players full control at all of the game’s potentially coolest moments. It all feels like a prototypical first-generation game, the kind of game where the developers’ creativity feels clipped because they surely spent a lot of their time simply figuring out how to develop on a new platform. It’s only right near the end when the game’s levels use the vast scale of VR graphics to portray interestingly complex structures that are worth craning your neck to take in. It’s only in the game’s last few combat encounters that it feels natural and necessary to start turning your head to glance at the patrolling enemies on the side as Victor sneaks past an enemy in front of him. It only feels near the end like the developers were getting comfortable pushing the player into tactically tougher situations in VR. More of that might have helped beef up Edge of Nowhere but would have also stretched a story that feels ready to end when it does. VR is for now a rich person’s delight. The PC I bought to run a Rift cost $1500. The Rift itself cost me $600. Oculus comped me Edge of Nowhere, but it’ll run most players $40. If you pay this right now, you’re paying for experimentation on a new platform. You’re playing in the first generation. And you’re playing the attempted answers to lots of difficult technical questions. Edge of Nowhere’s primary question is whether a perfectly standard type of video game is worth putting into virtual reality. There’s nothing about it that demands it be experienced in VR. Given how frequently the player must simply look ahead to keep their focus on the lead character, there’s barely any gameplay impact. But the sense of scale that VR provides a game like this is remarkable. The comfort with which you can play this game is an example for other VR developers to follow. Yes, it is good and satisfying and even spectacular to play a traditional third-person action adventure in virtual reality.